Oulu is a city with 139151 inhabitants lying in the region of Northern Ostrobothnia in northern Finland. It is the largest city in Northern Finland and the sixth largest city in the country. 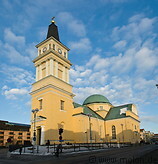 Oulu was founded in 1605 by King Charles IX of Sweden at the mouth of the Oulu river on an ancient trading site. In the last century Oulu has evolved from a city known for wood tar and salmon to a high tech centre of competence focused on IT and telecommunications. Oulu has a large university with 17000 students. The city itself is unremarkable and has no major tourist attractions.